Another thing that I have been on the lookout for this spring is cheap floral flats. I’ve also been on the lookout for some denim flats. Luckily, I found some winners! All 4 of these shoes are very comfortable. The Payless shoes, above, have memory foam insoles. I really like the denim shoes because I sometimes have issues with trying to figure out what shoes I should wear with certain shirts and jeans. The black and white striped Target flats, are great for pairing with floral tops, scarves and purses, as I mentioned in my previous blog. The opposite is true for the floral Target flats – they would look great with stripes and dots. Here’s an outfit I created with the Target shoes above; consider them Part 3 to the Mixing Pattern Blogs (Part 1 and Part 2) I posted earlier. Polka Dot Shirt from ModCloth. Cardigan from Target (similar here). Jeggings from Levi’s. Shoes from Target (click on link above). Cat Watch from Charming Charlie’s (click on pictures at the beginning of post). Earrings from Target. I still see a ton of mint things out in the stores, so I think that color is going to stay around for quite a while. I love mint! Since it’s time for spring cleaning, I thought I would start selling my old clothes on Ebay…especially since I just found out that we got pushed up into the next tax bracket and we have to pay some unexpected taxes!! Click on the “Shop My Closet” page link at the top of this page. I think I’m going to do these “style finds” blog posts once a week…there are just so many cute, new things out there right now! Lauren B. • This entry was posted in Fashion. Bookmark the permalink. Cute, Lauren! I’ve been eyeing both pair of the Target shoes! And of course, I already have those floral shoes from Payless AND the orange purse from Target! I’m seriously thinking I need to add some more of their shoes to my collection. They have such cute colors, too! Twinsies!! The Target shoes are great and comfortable. I had to size up a 1/2 though. And those PayLess shoes are SOOOO comfortable, aren’t they? I had no idea. 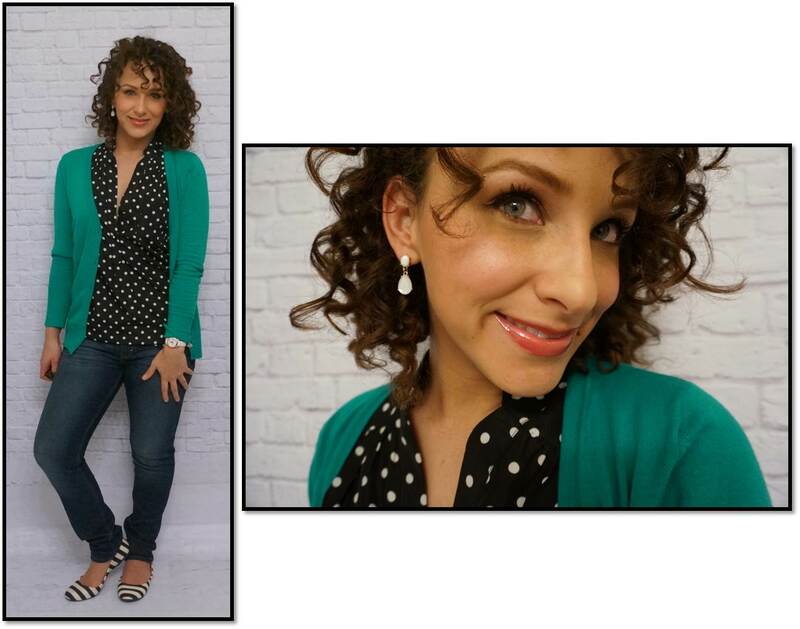 Love the polka dots with that cardi!! So cute!! I wish I had a Charming Charlie’s by me! !